The dishes are served ! When open, we get fresh seafood from the Varanger Fjord, making dishes for you that you rarely find elseswhere in Norway. The quality is the very best. Quite a few people know and appreciate our well-rounded and delicious Fish Soup Varanger, containing some salmon, cod, coalfish and shrimps. We use wild salmon only - we take care of your health, so breeded salmon is not served in this restaurant ! 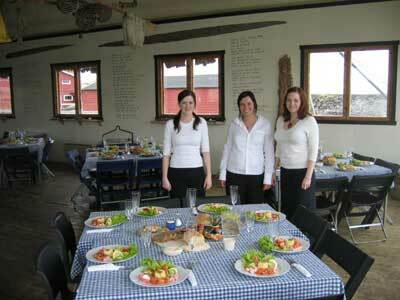 We also offer you a dishes of meat from reindeer, they are herded on the Varanger Peninsula by the Same people. We hope to have the possibility to serve the claws from the larges crab in the world; the Kamsjatka Crab or the Red King Crab. We catch it here in the Varanger Fjord. When open, please call +47 9050 6080 to make a table reservation or just to ask about the menu. You also may send an E-mail to Havhesten.